It’s always a thrill landing in one of the world’s greatest cities, but as we make our way into the arrivals lounge at Madrid’s Barajas Airport, it seems the rain in Spain – on this occasion – falls mostly outside of the plane. I knew I should have invested in a poncho. Anyway, it was our first time in Madrid so, aside from the weather, we were itching to see what Spain’s Castilian capital had to offer. Not strictly on a sightseeing tour or cultural odyssey (it happened to be a, um, stag-do), our introduction to the place involved pool and absinthe. Served alight. First night syndrome out of the way, we knew we couldn’t come to Madrid without seeing Guernica. Painted in 1937, the city is now home to Picasso’s response to the atrocity of the bombing by German and Italian forces (to aid the Nationalist forces of General Franco) of the town in the Basque country earlier that year. Coincidentally, making our way to the Museo Nacional Centro de Arte Reina Sofia, where Picasso’s indictment of the bombing is housed, we passed a rally. At first we thought it was to do with the Occupy movement, which had seen thousands protesting outside Spain’s parliament in Madrid earlier that week. In fact, it was a meeting of speakers demanding the creation of a Truth Commission to properly deal with the unresolved legacy of the crimes against humanity committed during the Spanish Civil War and the Franco regime. It was against this backdrop we went off in search of Guernica. Arriving at the Reina Sofia (situated not far from the Atocha metro station), it’s fair to say it’s an impressive sight: there have been recent additions to what was an 18th century hospital, with a pair of glass elevators and a modern annexe, opened in 2005. 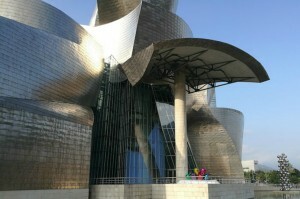 With two floors devoted to permanent collections and one for temporary exhibitions, there is a lot to see. Still thinking about the Franco regime, it was the Utopias and Conflicts (1900-1945) collection that impacted most. But then, with one single floor containing the likes of Joan Miro, Pablo Picasso, and Luis Buñuel, this is no great surprise. Aware that Guernica was at the end of the flow of this floor, we deferred gratification as long as possible. Which wasn’t as difficult as you’d think. 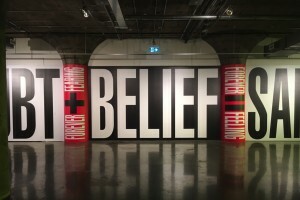 Walking past (then back to, and for some time) the subversively satirical work adorning the walls, it occurred to us that it is always startling – and heartening – that out of great despair come great works of art, produced in riposte to the very worst depths of human nature. 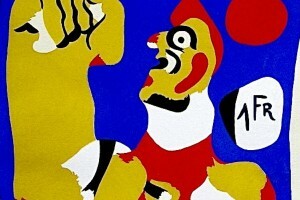 Catalan artist Joan Miro added his voice to the cacophony, with Aidez L’Espagne (Help Spain), also from 1937. Beneath the main image (unmistakably Miro) reads the legend: “In the current conflict on the Facist side I see massive forces, and on the other side are the people whose immense and creative resourcefulness will give Spain a vitality which will astonish the world.” Amazing the weight and hope 35 words can carry. Eventually, we approached the room where Guernica hung, and you can hear a rising hum, not of awe exactly, but something like it. As we get to the entrance, we are faced with a group of people three rows deep, who we must navigate through and around before getting a proper look at the reason we came. The first thing that strikes you is that, despite having seen it on TV, and countless times in reproduction, the scale of Guernica is stunning. It is imposingly large (3.5m by 7.8m), and for a while this is all you really take in. The next thing that becomes apparent is how the gaze, unusually, is drawn from right to left, and while it is typically abstract, the thing that hits home is that there is carnage everywhere. More telling though, toward the bottom right, is the severed arm, still grasping a broken sword. 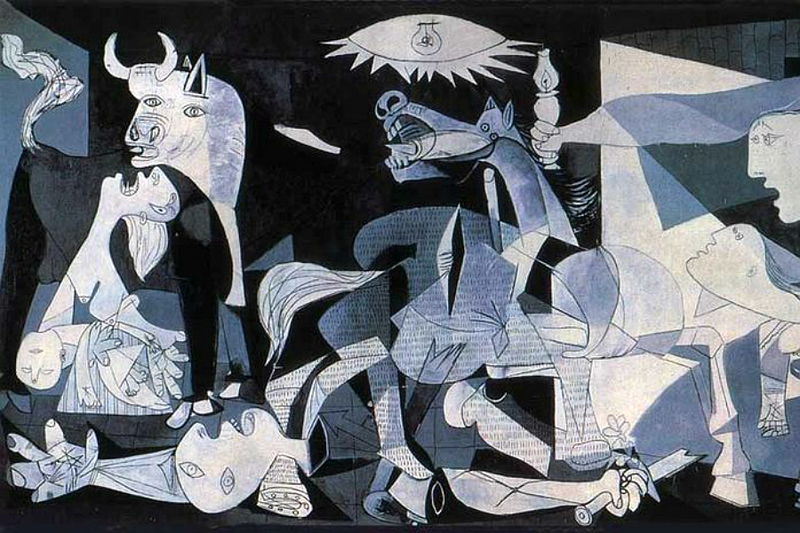 It doesn’t take a direct line to Picasso’s subconscious to hazard a guess that this symbolises the crushed will of the people, ordinary people in Guernica whose lives were irrevocably changed on the 26th of April, 1937. While Spain still has its problems in coming to terms with the horrors of its civil war (illustrated by the shared amnesia of the astonishing pact of forgetting), the fact that such a symbol of anti-Francoism as Guernica rests in his traditional seat of power is, to say the least, encouraging. Emerging into the sun. 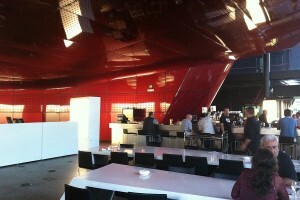 the rest of the afternoon was spent in the cafe bar which adjoins the museum. Architecturally, you can’t help but think the aim was for ‘stunning’. It doesn’t fall too short at all, and the thought occurs as we sip our mahou’s that, had it been decked out in white, it wouldn’t have seemed out of place in Kubrick’s 2001. Dragging ourselves away from the civilizing effect of art, we’re off again. This time in search of a record shop we’ve heard of. When we find it, Discos La Metralleta (don’t be put off by the logo) is a treasure trove of vinyl. We could have spent hours (and many euros) there, but time was getting on. Paying for the David Bowie and Velvet Underground albums we already own on CD, our minds turned to a night on the tiles in what had turned out to be – unsurprisingly – a city with a lot to offer, even for those staying for just a few days. But with only half of the next day left in Madrid, we sought to extend our experience of a city we feel we’d like to know better. To that end, we’d heard of a club. Independence had popped up on an indie guide to Madrid, and finding it meant we would avoid the traditional ‘Brits land in Spain, find Irish bar’ scenario. Once there, with a cheapish bar and Simian Mobile Disco’s We Are Your Friends blasting, we soon felt at home. 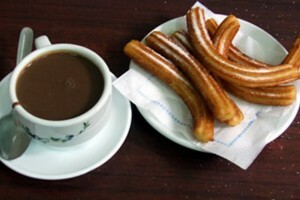 Next morning, complete with heavy heart (and hangovers to match), we went off in search of one of our favourite Spanish delicacies – chocolate con churros was the perfect remedy to those heads and stomachs not yet bearing up, and later on the flight, the decision was made. Next time (and there will be a next time) we come to Madrid, we won’t start with flaming absinthe.